For certain injuries, traction is very valuable as a treatment to speed the healing process. Disc injuries respond well – disc tears, herniations, bulges, and sciatica. Traction has been shown as an effective treatment to manage these injuries in a non-surgical way. Disc injuries can be among the most painful injuries imaginable – causing neurological symptoms like extremity numbness, shooting pains, and even weakness. Our Triton DTS Traction unit is state of the art. 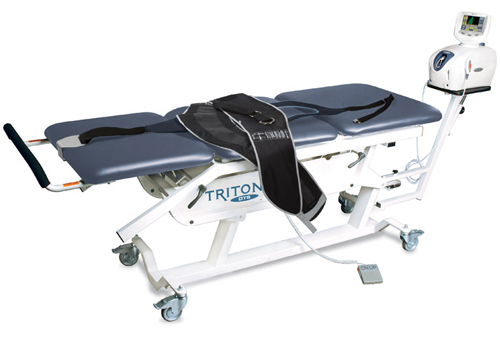 It is capable of both cervical (neck) and lumbar (low back) traction – controlled by an advanced computer model. Combined with chiropractic care, this has done wonders for our patients.